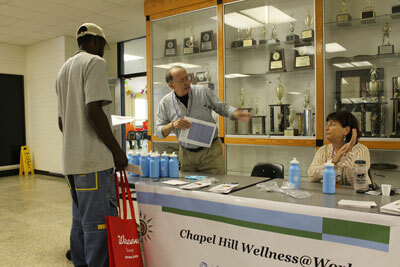 Wellness@Work is a work site health and wellness program launched by UNC Health Care Department of Family Medicine in partnership with the Town of Chapel Hill. The mission of Wellness@Work is to promote greater health awareness by providing information, activities and services designed to support healthy lifestyle choices for employees. A dedicated employee wellness clinic staffed by a UNC Family Medicine health care team including a nurse practitioner, registered nurse, nutritionist, and tobacco treatment specialist. Together, this team provides accessible care for minor illness, wellness appointments, and tobacco cessation at no cost to employees. “Annual Health Risk Assessment” including an online questionnaire, diabetes and cholesterol screening, and weight and blood pressure measurements. Web-based health information portal where employees can schedule appointments, view lab reports, interact with members of the health care team, and access health education resources. Educational programming focused on reducing the risk of heart disease, diabetes, obesity, and other chronic conditions. If you are interested in working with UNC Family Medicine to implement a Wellness@Work program in your workplace, please contact us at wellnessatwork@unc.edu or 919-843-6882 .